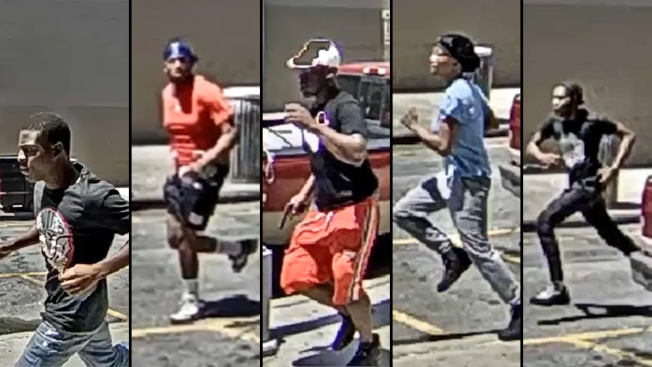 Authorities released new surveillance video over the weekend in connection with Friday's shooting in downtown Brooklyn that wounded three people, including two innocent bystanders, at the Fulton Mall. The surveillance video shows five people cops are looking to identify who had been arguing with a 28-year-old man; someone in that group pulled out a gun and shot that man in the hand, authorities say. It's not clear what they had been fighting about. A 27-year-old woman who had just left a job interview and a 31-year-old man who was walking with a coworker in the bustling intersection at the time were both shot in the fray. She had two graze wounds -- one to each arm -- and he had a gunshot wound to the right leg, authorities say. All three victims, who are from different areas of Brooklyn, are expected to fully recover. The broad daylight shooting was jarring for both people who live and work in the area and for police, who described it as rare for that location and time. "We're in area of Brooklyn, it's broad daylight... it's beautiful out, it's sunny, very active, as you can see, with thousands of people walking up and down the streets," NYPD Deputy Chief Michael Kemper said Friday. Witness James Rice was manning his sunglasses stand nearby, and quickly realized that what he first thought were firecrackers were actually bullets when he saw the victims scream and drop to the ground in front of the Gap Factory store. "It's very crazy, this time of day, that someone would have the nerve to shoot people," he said. Police say they've recovered three 9-millimeter shell casings from the scene, and are interviewing witnesses. Anyone with information is asked to call police.